Looking for easy acoustic guitar tabs? We compiled this list of fairly easy to play guitar songs, and have provided links to interactive guitar tab. 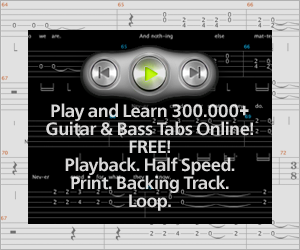 This will allow you to not only see the tab, but also to hear it as it is played. Chords are shown in most cases as well. What do we mean by easy acoustic guitar tabs? They tend to use basic chords, and have simple picking patterns, without too many fast changes. Artists include Coldplay, Jack Johnson, America, Greenday, Neil Young, Johnny Cash, Bob Dylan, and Tom Petty. You’ll recognize most of these songs from the radio. So grab your guitar and play along with some of these easy acoustic guitar songs! Note: after you click the links below, click on the blue "play" button to start the interactive tab. 1. Tune-up Your Guitar- sounds pretty obvious but you won't sound good or have fun unless you have a decent guitar that is well tuned... check out this online tuner if need be. 2. Know How to Read Tabs- This is a basic skill for playing tabs...if you need a lesson or brush-up, click here. 3. Know the Basic Chords- Most of the easy acoustic tabs on this page make use of basic open chords. If you need more info, see this basic guitar chord chart.